My article on Elaine de Kooning in the last issue of Ragazine apparently proved quite popular. So I will write about another person included in the Denver Museum’s exhibition “Women of Abstract Expressionism” and who was also someone I worked with and knew quite well. That woman was Helen Frankenthaler. In fact, from where I am sitting now writing this, I can see one of Helen’s screen prints hanging on a wall in my living room, the same wall that has a drawing of me made by Elaine de Kooning. The Denver show closed on September 25, so if you haven’t seen it, as I have not, I am sorry that we missed it. As I have written in a previous article for Ragazine, having reached the age of 78, I have no desire to go anywhere anymore. This statement comes from a man who has over 5000 hours flying his own airplanes to places like Haiti and the Bahamas, and has visited 49 states in the US and 36 countries in Europe, Africa, the Middle East and South and Central America. While working on her print for the New York Ten portfolio I introduced Helen to the “tusche and glue” technique. I had her apply liquid tusche, a black oily substance, directly onto the stretched silk where she wanted a color to appear. After the tusche dried, I coated the entire screen with a water soluble glue mixture of my own concoction. The oil-based tusche resisted this glue coating. When the glue dried I washed out the tusche with mineral spirits, leaving the pattern as an open area in the silk that the paint could be squeegeed through. While I didn’t invent this technique I did spend a considerable amount of my time getting these components to just the workability that I desired. Helen immediately took to this method of making a stencil as she could spill, splatter and spoon the tusche on the raw silk in a manner similar to that of her working on paintings on raw canvas. Unlike her paintings, however, it was only after she got the forms designed that she could work on the colors. So we spent many hours at the printing table pulling proofs in various color combinations, until we got the print to look the way she wanted it to. We did several editions together and Helen seemed to enjoy herself working in my shop. Although a prominent member of the avant-garde, Helen was not exactly a bohemian. She drove down to my shop from her uptown residence in her white Mercedes-Benz convertible. As Jefferson Street was only two blocks long, lined with empty loft buildings and ending at the East River, she never had any problem parking right out front. The patrons in the bar on the corner became quite used to seeing snappy transportation arriving at my door: Nick Krushenick in his Porsche, Larry Rivers on his BSA motorcycle, and the occasional chauffer driven Rolls-Royce of a wealthy art collector. As most of the occupants of 76 Jefferson weren’t exactly legal, artists without residence permits, and a few drug dealers, the street door was kept locked, and there was no buzzer. The normal procedure was for the visitor to stand on the sidewalk and yell up the name of the person that they wanted to visit. A window would open, or sometimes not, and the caller would be recognized. Thereupon a key to the front door would be thrown down in a weighted sock. There was no elevator so guests had to walk up rickety wooden stairs lined with dangling fire buckets. If you are not familiar with these, they were bright red buckets filled with water, hanging from hooks in the hallways, two per floor. The idea being that if a fire should start you could throw this water on it before hopefully getting out of there. Such was the technology of the 1960s, perhaps carried over from the 1860s when the structure was first built. It wasn’t all that bad though. The building, 76 Jefferson, became so popular as a residence for artists that in 1972 the Museum of Modern Art mounted a show of all the people of note that had had studios there. I was included as well as many of the screen prints we had created and the Paris Review poster series which we also printed. The incident I most remember about working with Helen was when she was invited by Pierre Cardin to design a scarf to be produced as a limited edition. She called me up and described the project and asked if I would work with her on it. I agreed, but made it clear that I would only produce the prototype. There was no way that Chiron Press was going to print thousands of silk scarves. So Helen and I worked together and came up with a design. Pierre wanted it printed on a scarf, so I agreed. I went and got textile ink, something I had never used before. The directions on the container said to make the product colorfast you had to press the dry ink with a steam iron. Now being at that time what one might call a “hippy,” I certainly didn’t own a steam iron, nor did anyone working for me. Asking around I couldn’t find anyone I knew who owned a steam iron. So we just decided to skip that part. Helen’s scarf looked okay as it was. And so Pierre Cardin arrived. He had come to see the scarf. Helen proudly unfolded it and laid it out on a table. Pierre looked at it with what I would say was a skeptical expression. He felt the fabric, holding it up to the light. It was perhaps too thick. I explained to him that this was only a prototype. He could have the manufactured ones printed on whatever he liked. We were having a communications problem. I was beginning to realize that Pierre’s English was rather limited, and I had not done well in my French class in college. “And is it colorfast?” Pierre asked. Before I could repeat again that this was only a prototype, not the finished product, Pierre had grabbed the scarf and was heading for our bathroom. Water could be heard running. Pierre emerged shortly with a disgruntled look on his face. 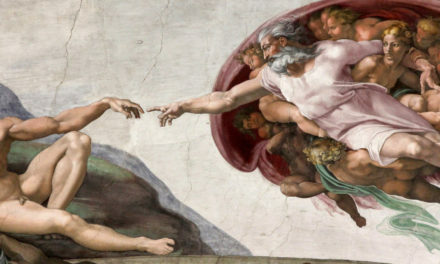 He was holding up a soggy mass of fabric. The colors had all bled together. “But this is only the prototype, you can have the finished scarves printed wherever you like, and have them made colorfast,” I repeated yet again. “This man” repeated his explanation that the wet and ruined scarf that he was holding in his hands was not a finished item, only a sample to display the design. I resisted telling Pierre that, at the price these scarfs were projected to sell for, I doubted that their owners would be the kind of people who would hand wash them in the bathroom sink. He was still ranting on. Why hadn’t I used a steam iron? Helen was repeating my explanation, giving me a smile and a wink. I retreated to a far corner of the studio. It was Saturday so none of the workers were in. Helen came and told me that Pierre had finally understood what had happened and would have the run of scarves produced at a commercial factory. I was relieved. The project would have involved a lot changes at Chiron Press which I had no desire of making. I went over and shook Pierre’s hand and showed him to the door. I made several other prints with Helen after that incident, but always on paper. After I left New York for Ithaca, Helen and I fell out of touch. She did come to Cornell once to open a lecture series. We spent some time together and had a good laugh recalling Pierre emerging from the bathroom with a grimace on his face and this runny piece of fabric in his extended hand. 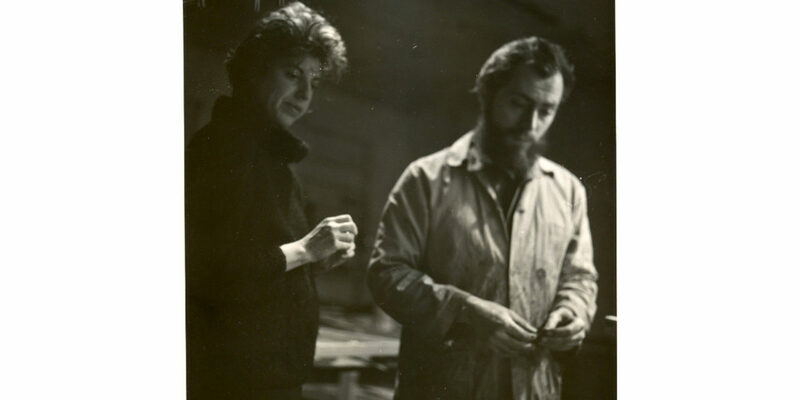 Helen Frankenthaler died in Darien, Connecticut, on December 27, 2011, at the age of 83.